Rye, set on a hill, is a very picturesque medieval town which used to be a sea port but the sea has now retreated 2 miles south although the remnants of the old sea cliffs remain. It is almost surrounded by three rivers, the River Rother on the eastern side, the River Tillingham on the western side and the River Brede to the south. 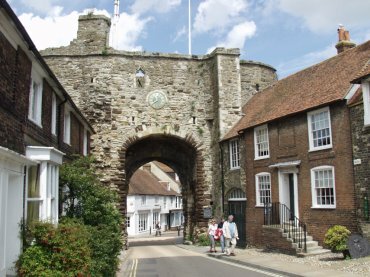 This archway, the Landgate, was part of Rye's medieval defensive wall although very little of that wall remains. We stayed in Rye, on our first trip, at the The George Hotel which is just a short walk behind the camera in the High Street. 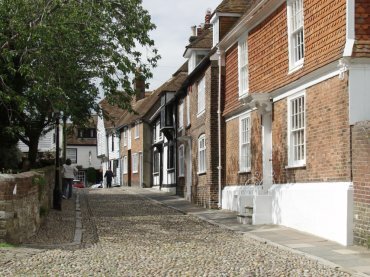 If you are planning to visit Rye by car then you must read the parking page and if you are planning to stay in Rye then you should read the information page. There are two very well known points of interest in Rye and they are the Mermaid Inn, immediately to the right, and Mermaid Street. You can see that Mermaid Street is cobbled, as it was in medieval times, with only a very narrow pavement on one side. The Mermaid Inn was built in 1156 but was rebuilt in 1420 and had close associations with smuggling. 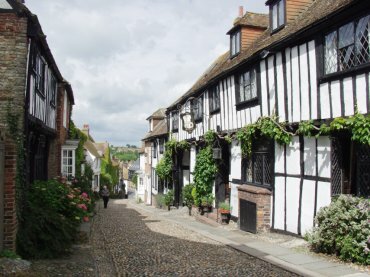 Mermaid Street is just one of a number of narrow, picturesque cobbled streets in the area around the church.It was this area of Rye that was used as 'Tilling' in the television series 'Mapp & Lucia'. We stayed in Rye, on our second trip, at the The Hope Anchor Hotel which is in Watchbell Street, just a short walk from Mermaid Street. 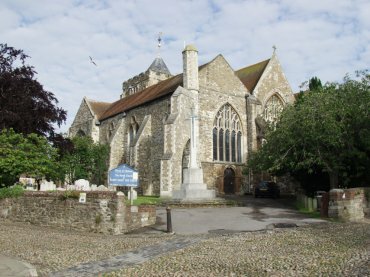 This church, dating from the 12th century, was extensively damaged in 1377 when Rye was looted and set on fire by French invaders. The roof fell in and the bells were carried back to France although they were recovered the next year when men from Rye and Winchelsea sailed to Normandy and took them back! The church tower is open to the public on most days and gives amazing views of Rye and the surrounding countryside from the top. The tower may not be as tall as some but being at the top of the hill the total height is considerable. There are paths and narrow roads surrounding the church and this road is on the south side of the square. This viewpoint is towards Market Street with the churchyard on the left. We found Church Square to be one of quietest and most delightful areas in Rye. 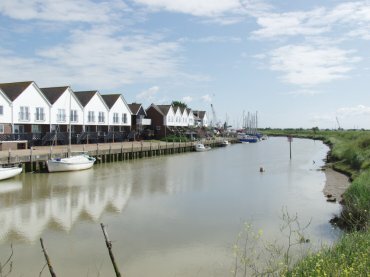 Strand Quay, at the foot of the hill, is on the River Tillingham which is one of Rye's three rivers. This view is from the bridge over the river carrying the Winchelsea Road. Enlarge Comment The area around Rye.